I’m about to share 4 incredibly simple practices that have the power to completely transform your physicality and mentality. Notice that I said these practices are simple, not easy. Sometimes the simplest act can require a significant amount of discipline. I recommend that you take on each practice one at a time until it becomes a habit. It takes about 40 consecutive days to develop a “new normal.” Once one of the practices becomes a habit, add in the next one. In order to succeed at this, you must commit right now - this very moment. Mentally invest in the dedication it will take, knowing that you are going to be feeling the best you ever have. I can tell you that I’ve adopted these practices and I’ve never been in better shape in my entire life. Remember, you have to do what others won’t, so you can do what others can’t. So, are you in? Let’s do this. Many people are walking around feeling tired and foggy because they are dehydrated. It can be challenging to get in enough water throughout the day. Every single body is different, so the common rule of 8 cups of water a day may not apply to you. Figuring out how much YOU specifically need is simple. Take your body weight in pounds and divide that number in half. Then drink that amount of water in ounces. So if you are 180 pounds, you need 90 ounces of water a day. That’s about 11 average-sized water bottles. You’ll want to mix in a couple sports drinks, as well. When you sweat, you lose a lot of electrolytes, including sodium, potassium and chloride. These electrolytes are crucial in helping your body function at optimal levels. An 8 ounce serving of Gatorade contains 110 milligrams of sodium and 30 milligrams of potassium. Definitely drink a sports drink after a hard practice. Set Yourself Up for Success: Get a reusable water bottle that you like (let’s be kind to our planet and reduce our use of plastic). When buying your water bottle, take a look at how many ounces it holds (it will usually say on the label). Then challenge yourself to refill it as many times as needed each day to hit the amount that will keep you hydrated. The perks? You won’t get as many muscle cramps. You’ll keep your memory sharp. You’ll be more energized (and less anxious/fatigued). Sleep is crucial to your success. The average adult needs about 7-8 hours of sleep per night. The average teenager needs anywhere from 9-11 hours. Sleep gives your body the opportunity to restore itself. Your cells make more protein while you are sleeping, which form the building blocks for your cells. This is when your body kicks into repair mode to mend any damage due to stress, ultraviolet rays and other harmful toxins. Odds are you probably would love to get more sleep, but find it difficult to wind down after a busy day. Set Yourself Up for Success: Get off of technology for at least an hour before you plan to go to bed. It can also be helpful to drink something warm like chamomile tea or heated up almond milk. Warm baths also help your body and mind unwind. Diffusing lavender essential oil in your bedroom can promote relaxation, too. Read a book while in bed to get your eyes tired and you’ll be drifting off in no time. The perks? You’ll reduce your risk of depression. You’ll improve your memory. Sleep even keeps your heart healthier! I’ll be honest with you, one of the biggest mistakes I made as a young player was heading to Burger King after a big game. If I were eating clean back then, who knows what my body would have been capable of. Try to get in as many green veggies as you can and keep away from refined sugars. Only eat fruit between noon and 6pm. Stop eating by 8pm, so your body has time to digest your food and initiate the process of recycling its cells. Stay away from gluten as much as you can, as many people are sensitive to it even if they do not have an autoimmune disease. Gluten can harm your gut, which isn’t ideal for keeping you at peak energy levels. Also try taking an Omega-3 vitamin. Omega-3 has a fatty acid in it called DHA, which is great fuel for your brain. Load up on healthy fats like avocados and almonds. You also may like to test out taking a spoonful of MCT oil each day, which is a potent form of coconut oil that your brain will love. Reduce coffee to one cup a day. The perks? You’ll turn on the genes in your body that promote longevity, keeping your body young and strong. You’ll improve your heart and brain health. You’ll build a stronger immune system. Meditation intimidates a lot of people, but it shouldn’t. It’s a practice that will positively impact every area of your life if you do it regularly. Many people think that meditation means that you are turning off your thoughts, so then when they try it and can’t stop thinking - they think they are bad at it! But your brain is meant to think - it’s impossible to totally turn off your thoughts! Meditation is simply practicing your ability to focus. You will use an “anchor” which is the thing you choose to focus on during your meditation. There are many different types of anchors you can try out from breath to sound to visualization to movements. If you commit just 11 minutes of your day to a meditation practice, you will immediately feel its benefits. Set Yourself Up for Success: For many athletes, it’s really hard to sit still at first. Try out a walking meditation before a big game. You will be focusing on your steps and breath. Begin to take slow strides around the rink. You will inhale through your nose for four segments - gradually filling your belly with air. Step (inhale) Step (inhale) Step (inhale) Step (inhale). And then exhale through your nose in four segments - gradually emptying your belly. Step (exhale) Step (exhale) Step (exhale) Step (exhale) … and then four inhales/steps, four exhales/steps, continue. Do this for at least three minutes to begin. The perks? You will turn on your parasympathetic nervous system, keeping you calm and relaxed throughout the day or before a game. You will reduce stress levels. You will be able to think more clearly. You will improve your ability to focus and increase your intuitive capabilities. If you want to learn more about meditation for athletes, check out our Mental Grit course. The sport of hockey goes beyond the rink, locker room or off-ice training gyms. Despite our “tough” reputation, I’d argue that hockey players are some of the most genuine, loyal and thoughtful people out there. The true athletes of this game understand that hockey is a way of life. We think, breathe and sleep hockey. But our life also becomes a way of hockey. It’s inevitable that we bring the disciplines and strengths that we learn from hockey into our individual lives, careers and relationships. That’s why I’ve been inspired to write more content that’s relative to the hockey community. There are many unseen hours that a hockey player spends sweating, strategizing and studying. I’ve noticed that a lot of the material available online isn’t helpful for players and coaches who are working at an advanced level. One of my gifts that I’m able to bring to the sport of hockey is my ability to simplify complex drills, plays, techniques and behaviors. Every month I’ll be sharing new insights and materials with you on this platform. I am grateful to get to spend my working hours with the talented youth and professionals of the hockey world. As we all know, hockey is a sport that’s typically adopted at a very early age in the player’s life. It’s rare for someone to pick up the game as a teen because it demands incredible skill, balance, agility and intuition that requires years to develop and master. When working with hockey’s youth, I’ve witnessed that our sport has an impact beyond physicality. It’s a pursuit that builds self-esteem, confidence and courage. I’m not a psychologist, but I’ve done my fair share of mindset research for my own personal, professional and athletic development. I’ve learned that our subconscious develops between the ages of 0-7 years old. Simply put, our subconscious is the vault that holds our deep-rooted beliefs. Our beliefs work their way into our conscious thoughts, in which we then base our decisions and build our connections. It’s incredibly important to have awareness around the influence that hockey installs within a player’s psyche at such a young age. Positive or Negative… It’s a Choice. Hockey can influence a player’s character, work ethic and self-perception. It becomes one with a player’s identity and his/her way of relating and being in the world. Like anything in life, it can have a positive or negative influence on an individual. It’s crucial to watch out for negative events and to appreciate positive payoffs. When a player is scolded for an imperfect play or unfortunate mistake, it can cast out the energy of “being wrong.” Nobody likes the feeling of being wrong or reminded of their failure. If the player continues to receive criticism instead of constructive correction, they’ll begin to resent the game. Even worse, something they once loved because it was fun, becomes something they start to fear and dread. Speaking of fun, it’s what the sport was made for. As players mature in their game, they begin to feel more and more pressure to perform. Usually it’s the players putting the pressure on themselves, so simple encouragements to get out on the ice and enjoy themselves can go a long way. Tip: A great example to offer constructive correction is to lead with a question, such as, “[Insert moment of game] seemed like a challenge, what was it like for you?” A player will feel way more empowered to offer their experience. You can then simply ask, “What do you think would help next time?” And then receive their ideas while also offering any further helpful feedback. There are so many positive benefits to hockey. For me, when I look back at my years as a player, it’s not the championships or MVPs I won that I remember. It’s not even the games I played or the practices that made me puke (though those are pretty memorable). It was the friendships I made and the laughs shared with my teammates. At Motor City Hockey, we value camaraderie, sportsmanship and having one another’s backs… even for our rivals. Hockey not only builds an individual’s confidence and charisma, but also his/her ability to thrive on a team. Work ethic is celebrated as much as heroic game-winning goals. What matters most is your love of the game, not necessarily your skill of the game. I’m writing on this topic because I have witnessed some of the best players get bullied in the locker room and on the ice. This behavior isn’t tolerated at MCH and it is my intent to develop inclusive, compassionate players. And the younger we can instill this morale, the better. Whether you have a youth hockey player or grew up playing, it’s pretty powerful to reflect on how the game has influenced you over the years. 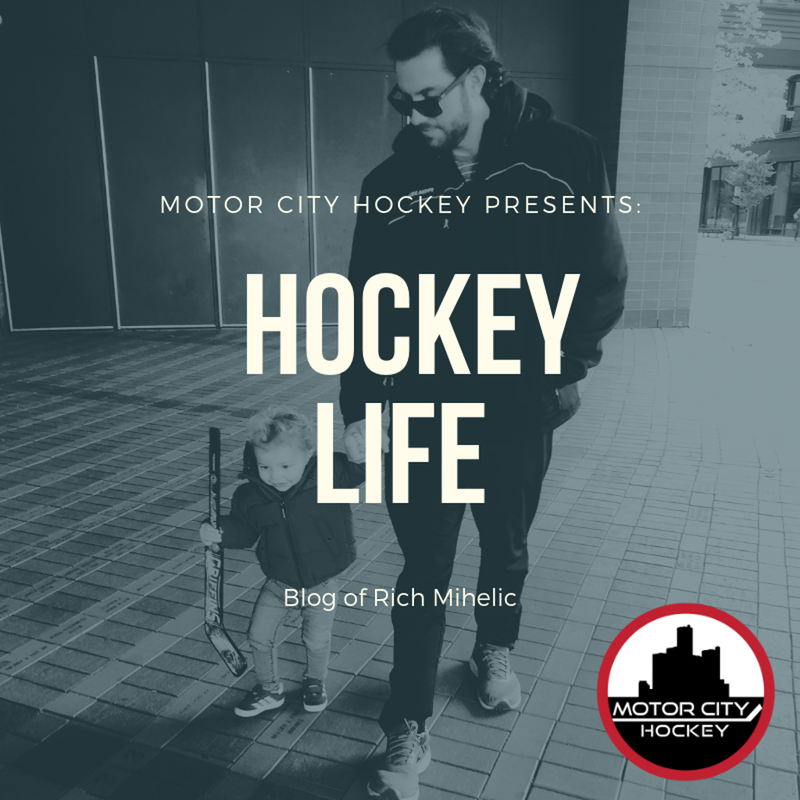 Now as I watch my two-year-old son running around with his mini hockey stick in hand, I can’t help but to think of how hockey altered my life for the better. I am more driven and physically stronger than I’ve ever been in my life, thanks to hockey. I feel more creative and inspired, coming up with new ideas 24/7, thanks to hockey. I get to be surrounded by the best people, thanks to hockey. And I am a better man, thanks to hockey. ©2019 Motor City Hockey / SportsEngine. All Rights Reserved.